The Los Angeles Lakers played much differently tonight; they pushed the tempo, fed the ball to the Dwight Howard, and most importantly, hit their free throws. However, the Lakers committed a season-high 25 turnovers as the Blazers ran away with this contest at the end of the 3rd and beginning of the 4th quarter largely on a 24-7 run. The whole bench played confused, lost and generally terrible, except for Steve Blake, who did a very good job defensively on Damian Lillard, and generally ran the offense with smoothness. Blake played 28 minutes due to Steve Nash injuring his left leg during the second quarter. He attempted to come back after a time out, but couldn’t put much weight on to it; he was ruled out for the game. 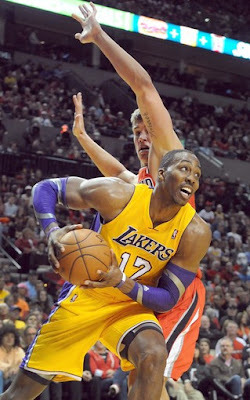 Despite the turnovers, the Lakers stayed in the game with great efforts from Dwight Howard and Kobe Bryant, who channeled their inner Shaq-Kobe, Super-Mamba combo for this game vs. the Blazers as both scored 30 or more points, however both were also plagued with foul trouble as they had 5 fouls a-piece. Bryant was making mistake after mistake with the ball as he had a season-high and team high seven turnovers. The Blazers pushed the tempo and managed to get 28 very easy points off of turnovers, combined with 10 offensive rebounds largely leading to easy points in the paint and with their 45% (9-20) shooting from deep, and you can easily see why they scored 116 points. Los Angeles looked helpless against the pick and roll in the first half, as Damian Lillard had his way with Steve Nash and scored the majority of his 23 points against him in the first half. Steve Blake managed to stop some of the bleeding defensively, and pressured Lillard into a couple of mistakes that helped keep the Lakers in it. Ultimately, turnovers from Bryant and Metta World Peace kept giving the Blazers easy points in transition, and keeping the Lakers from making up any ground. Foul trouble plagued the Lakers; Pau Gasol had 3, Bryant had 5, Howard had 5, World Peace fouled out; the only starter that wasn’t in foul trouble was Steve Nash, and for obvious reasons. Los Angeles played a sloppy game all over the court, except in offensive execution; they shot 50% from the floor, and had 21 assists to the 36 baskets made and the assists coming from everywhere: Howard had 5, Nash had 4, Bryant had 3, Gasol had 2, even World Peace was getting into the passing action and also contributed 2 assists. Los Angeles had another good offensive night; ultimately, turnovers and poor defense dooms the Lakers against the Blazers, wasting an excellent game from its dynamic duo in Dwight Howard, who finished with 33 points on 9-15 shooting (15-19 from the charity stripe! ), 14 rebounds and 5 assists and Kobe Bryant who chipped in with 30 points and 6 rebounds of his own, while shooting 50% from the floor (10-20) as LA falls to 0-2 for the second season in a row under head coach Mike Brown.